AFSC Board Chair Jennifer Wood and Minister Oneil Carlier. A new board of directors will provide oversight and accountability at the Agriculture Financial Services Corporation (AFSC). The eight-member board was selected through an open recruitment process and includes individuals with a wealth of experience in agriculture, agribusiness, rural entrepreneurship and board governance. AFSC’s previous board of directors was dismissed in June 2016 after an examination by Alberta’s Chief Internal Auditor raised concerns about oversight of senior executive expenses and procurement practices. 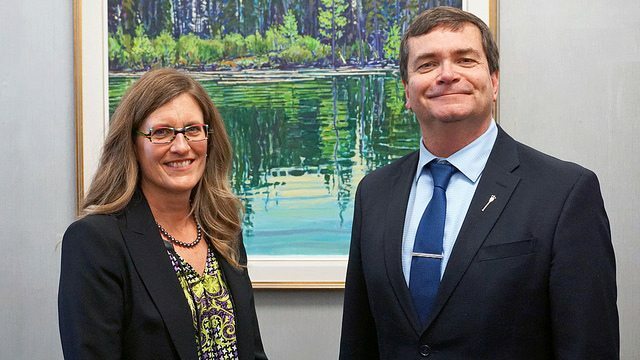 For almost a year, an interim board, appointed by Oneil Carlier, Minister of Agriculture and Forestry, led the organization in providing services to Albertans. The newly appointed board of directors assumes its responsibilities immediately. Jennifer Wood (Edmonton): Jennifer Wood, who will serve as AFSC board chair, is a professional agrologist, a partner in a private equity holding company that focuses on the agribusiness sector and co-operates her family cattle ranch. Wood has 15 years of board experience in a variety of roles, across sectors. Gerald (Jerry) Bouma (Edmonton): Jerry Bouma, is a partner in an agri-food management consulting firm and has more than 35 years of experience in strategic planning, business and marketing management and market research in the agri-food sector. Bouma has a Master of Science in Agricultural Economics and decades of varied board experience. Gordon Cove (Red Deer): Gordon Cove has experience in the agri-food industry including policy, program funding and international market and business development. Cove has served on multiple boards, has participated in board governance training and was the most recent president and chief executive officer of the Alberta Livestock and Meat Agency. Peter Galloway (Fort Saskatchewan): Peter Galloway is a professional agricultural coach and manages a fourth-generation family farm operation, producing, processing and marketing cereal grains, pulses and oilseeds. Galloway has more than 25 years of board governance experience in the areas of agriculture and co-operative, non-profit financial (banking) services. Jo-Ann Hall (Stony Plain): Jo-Ann Hall has more than 30 years of experience with the Alberta Public Service, most recently as an Assistant Deputy Minister with Alberta Agriculture and Rural Development. Hall has experience in the development of leadership capacity and financial management, as well as a background in accountability. Harvey Hagman (Mayerthorpe): Harvey Hagman has served on a number of boards related to agriculture and rural development. Hagman is president of the Hagman Cattle Company. He recently finished a Professional Director Certification Program and has received Professional Director and Professional Director Government designations. Anna Harder (Camrose): Anna Harder is a Chartered Professional Accountant with a focus on agriculture and agribusiness and has a background in agricultural work in grain and mixed farming. Harder’s board governance experience, of approximately 30 years, has focused on social services. Kiren Singh (Canmore): Kiren Singh is a financial executive with more than 25 years of risk management, insurance, credit and capital markets experience, holding senior roles in the energy industry. Singh is actively involved in the community supporting organic farming, sustainable land development and agri-tourism and is a director and chair of the Finance and Audit Committee of Travel Alberta. She has a Master’s of Business Administration and is a CFA charter holder.